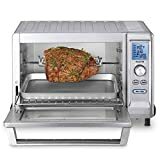 This convection oven is one of the best convection ovens on the market because it has a lot of upside to it. You won’t be able to cook a ton of food at once, but it does an excellent job of cooking a quick snack. It heats up quickly, which is always good for those needing a quick snack. It may not go up to high enough temperatures to cook some foods, but it’s ideal for reheating pizza. You can avoid the soggy crust after a pizza has been in the microwave. The convection oven may not change your life, but it will work well enough to give you the flavor you would want from your food. Convection ovens are great for those that want to cook food quickly without ruining the flavor. Microwave ovens can cause food to lose flavor, and become soggy. 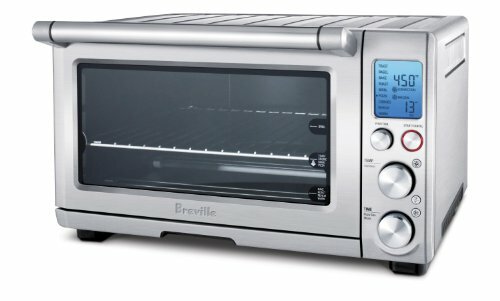 If you’ve thought about getting a convection oven, the Breville BOV800XL Smart Oven 1800-Watt Convection Toaster Oven with Element IQ is an excellent choice. It is easy to use, and has all the features one would want for cooking. It heats food up quickly and efficiently, saving power and keeping more money in your wallet. We’ll tell you everything you need to know about this convection oven. The convection oven has an Element IQ feature that makes it easy to cook. It delivers the perfect amount of power at the ideal times when you’re cooking. It can adjust the taste for your liking, allowing your food to come out perfectly. The convection oven can be programmed to your preferences, remembering how you like every food cooked. It’s ideal for those without a lot of time to spend on cooking meals for the whole family. The convection oven has 9 different functions for you to choose from for different types of cooking. You can choose; toast, bagel, bake, roast, broil, pizza, cookies, reheat, and warm. No matter what type of food you’re cooking, you can find the right setting for what you want to eat. You won’t have to deal with greasy or soggy foods from the microwave. Just set your food inside the convection oven, choose the proper setting, and let it go to work. You can spend more time doing the things you love while your food is cooking. The convection oven runs at 1800W to deliver heat quickly to the food. It can crisp your food up fast, allowing you to have a quick snack during the day. The 5 Quartz heating elements help deliver the heat at an unprecedented speed, allowing you to enjoy your food faster. Not only will your food heat up quickly, you’re not left with a soggy mess like you would with a microwave. When your food is cooking, the LCD colors on the oven change from blue to orange to let you know when your food is done. It has a backlight that is easy to read in the dark, and you can read it easily in the day time. You won’t have to guess when your food will be done when you can see the backlight. It’s the ideal way to make sure your food isn’t over or undercooked. Having a warranty on any appliance is the best way to ensure it gets fixed if something breaks. While some appliances don’t offer any type of warranty, this convection oven gives you the ability to use it how you want. If it breaks, you can get the parts replaced through the manufacturer. This is an excellent appliance for those who are always on the go. 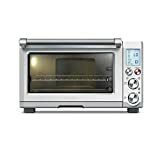 If you’re in college and need a quick snack, this convection oven will work well. Using the oven for toast is an excellent way to get good use out of this oven, as well. If you’re planning on feeding a whole family, this isn’t the convection oven for you. It is compact and too small to fit large portions of food. You can’t expect this convection to cook a whole pizza, but works well for smaller food portions.